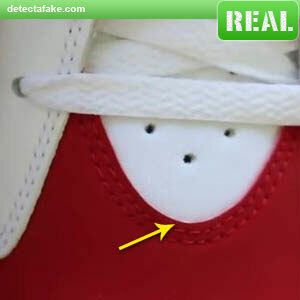 Next, look at the ribs near the top of the shoe on the sides. 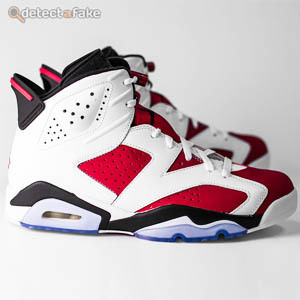 They should appear very clear and prominent. 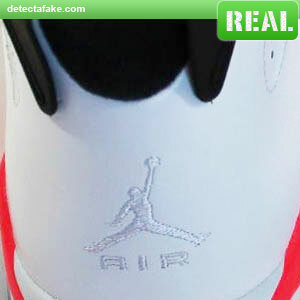 As you can see in the fake above, the top rib is barely visible. Next, press the side cushion. They should be soft, but not too soft. They should feel kind of like a soft rubber but should not feel like you are pushing on a pillow. 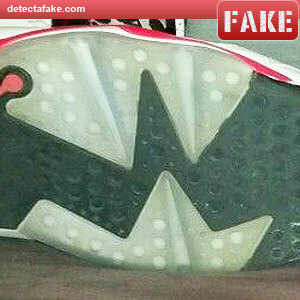 Most of the fakes are very soft. 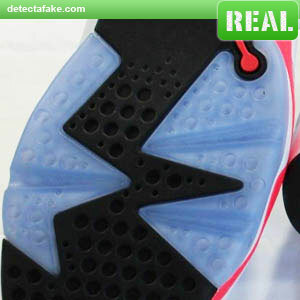 Next, look at the material texture around the shoe side. 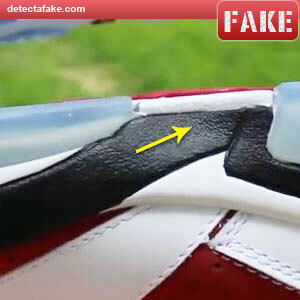 Notice on the fake one above, the surface appearance is much rougher than the real one. Next, look at the front cut. 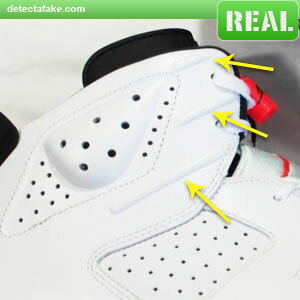 The real one above shows the contour the Jordan 6 retro's should have. 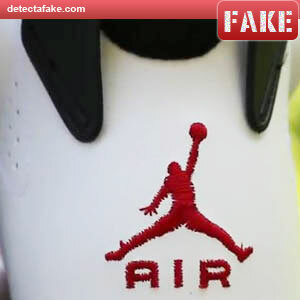 Notice on the fake one above, it's much shorter than the real one. 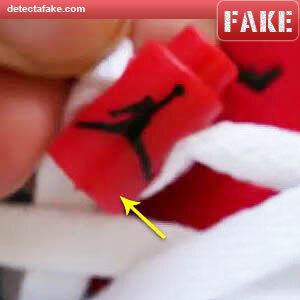 Also, if you see one with a "23" instead of the jumpman, it's fake. 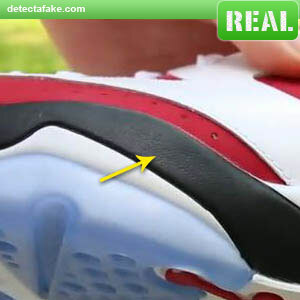 Next, look at the color of the sole. It should have an icy blue color to it. 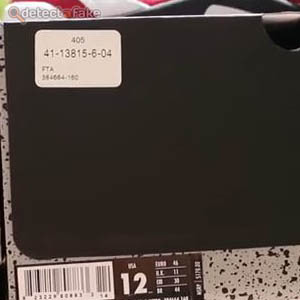 Some of the fakes have an icy blue color towards the sides of the shoe, but as you look in the middle, it's less noticeable. 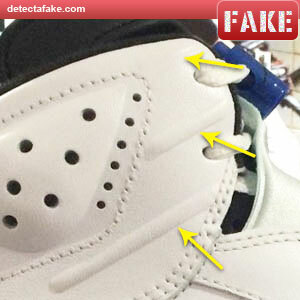 The fake above shows no signs of the icy blue color. Next, push on the shoe pull (or handle). It should not be too flimsy. It should be flexible but offer some resistance when you push down on it. 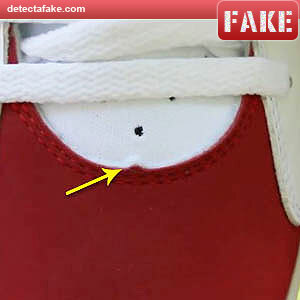 In the fake above, there are a few problems. 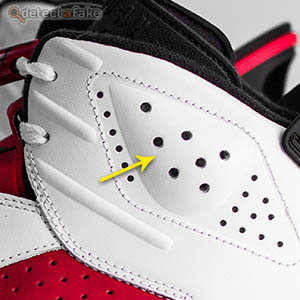 (1) The leather from the shoe pull comes down too far (to the jumpman). 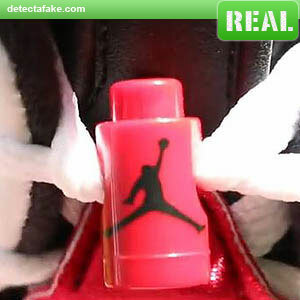 (2) The jumpman and "AIR" is much bigger than the real one. 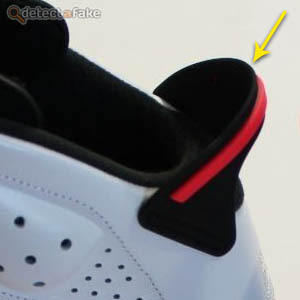 (3) The quality of the jumpman is very poor.